It is graduation season, and as thousands of new graduates across the United States prepare to leave their universities for the next chapters in their lives, commencement speakers throughout the country hope to teach one last lesson to the newest members of the workforce. On Monday morning, Jill Abramson delivered an address to Wake Forest University's Class of 2014 that was exceedingly short, quite funny, and inevitably focused on her departure from The New York Times. It was somewhat uncomfortable, considering her status as a recently fired employee, perhaps, but not nearly as uncomfortable as the commencement speech delivered by William G. Bowen at Haverford College. But as uncomfortable as his speech was, it included an important message about the necessity of discourse. 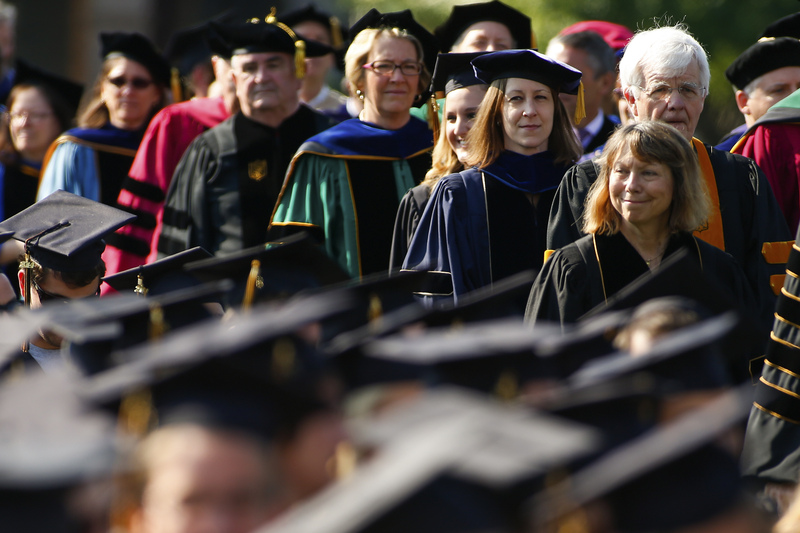 Bowen, the former president of Princeton, was selected as Haverford's commencement speaker following the protest and subsequent withdrawal of Robert J. Birgeneau, the former chancellor of the University of California Berkeley who was initially chosen to take the podium at the graduation. More than 40 students from Haverford and three faculty members, who were alumni of Berkeley, criticized Birgeneau's handling of a 2011 protest at the California university, in which police force was used to quell a a student demonstration on college costs. So incensed were these students and professors by Birgeneau's perceived failures that they sent Birgeneau a letter that included nine conditions for his appearance at the graduation, including a public apology for his involvement in the 2011 incident, reparations for its victims, and an explanation of his position. Birgeneau refused, and withdrew from the graduation ceremony and from receiving his honorary degree from the College. But when protestors succeeded in removing Birgeneau from their graduation, they were likely unprepared for the harsh remarks delivered by his replacement, Bowen. Whereas most commencement speeches celebrate the achievements of new graduates and offer words of support and encouragement for students, Bowen's address featured unabashed criticism for students he called "immature" and "arrogant." I am disappointed that those who wanted to criticize Birgeneau's handling of events at Berkeley chose to send him such an intemperate list of "demands." In my view, they should have encouraged him to come and engage in a genuine discussion, not to come, tail between his legs, to respond to an indictment that a self-chosen jury had reached without hearing counter-arguments. Such an inappropriate reaction, Bowen said, and Birgeneau's subsequent response, marked a "defeat" for the College. Bowen did not reserve his disappointment solely for the students, but also noted his dismay at Birgeneau's failure to come forth and address student concerns. Bowen said that Birgeneau "responded intemperately, failing to make proper allowance for the immature, and, yes, arrogant inclinations of some protesters. Aggravated as he had every right to be, I think he should be with us today." Haverford is certainly not the first institution to have its graduation marred by some controversy. A number of schools have had problems hanging onto their commencement speakers, all following student protests. Condoleezza Rice, who was originally slated to speak at Rutgers University's graduation, withdrew following student anger about her involvement in the Iraq war, and Smith College refused the presence of Christine Lagarde, International Monetary Fund president, accusing the IMF of fostering "imperialist and patriarchal systems." After Somalian feminist Ayaan Hirsi Ali made critical comments about Islam, Brandeis decided that she too would no longer be permitted to speak at graduation. Though student protests are often a critical component of progress and pushback against the norm, Bowen perhaps could be right in noting the growing number of these demonstrations may do more harm than good. When commencement speakers are forced to withdraw due to student dissatisfaction, it does not necessarily mean that students have "won" or that the protests have been "effective," which often seems to be the assumption. Though students absolutely should have the right to protest people, actions, and events they find troubling, these protests should lead to discussions and an attempt to foster understanding and mutualistic progress. Protestors at Haverford likely still believe Birgeneau to be an uncompromising monster whose actions they cannot understand, and Birgeneau was unable to share his experiences and his story as a highly respected educator and administrator. Protests are not meant to make noise or create controversy, but rather to draw attention to important problems and make change. But the exclusion of individuals, any individual, does not draw the right kind of attention, nor does it facilitate change. This year, a plethora of schools, including Boston College and Harvard University, have some sort of protest surrounding their commencement speakers. And this is not necessarily a bad thing — it shows passion and a willingness to mobilize. But these protests should result in steps forward, not shutting people out.